Illustration of Exposure Risk Assessment and Management related to anticipation, recognition, evaluation, control and confirm. Occupational hygiene (United States: industrial hygiene (IH)) is the anticipation, recognition, evaluation, control, and confirmation of protection from hazards at work that may result in injury, illness, or affect the well being of workers. These hazards or stressors are typically divided into the categories biological, chemical, physical, ergonomic and psychosocial. The risk of a health effect from a given stressor is a function of the hazard multiplied by the exposure to the individual or group. For chemicals, the hazard can be understood by the dose response profile most often based on toxicological studies or models. Occupational hygienists work closely with toxicologists (see Toxicology) for understanding chemical hazards, physicists (see Physics) for physical hazards, and physicians and microbiologists for biological hazards (see Microbiology Tropical medicine Infection) Environmental and occupational hygienists are considered experts in exposure science and exposure risk management. Depending on an individual's type of job, a hygienist will apply their exposure science expertise for the protection of workers, consumers and/or communities. The British Occupational Hygiene Society (BOHS) defines that "occupational hygiene is about the prevention of ill-health from work, through recognizing, evaluating and controlling the risks". The International Occupational Hygiene Association (IOHA) refers to occupational hygiene as the discipline of anticipating, recognizing, evaluating and controlling health hazards in the working environment with the objective of protecting worker health and well-being and safeguarding the community at large. The term "occupational hygiene" (used in the UK and Commonwealth countries as well as much of Europe) is synonymous with industrial hygiene (used in the US, Latin America, and other countries that received initial technical support or training from US sources). The term "industrial hygiene" traditionally stems from industries with construction, mining or manufacturing and "occupational hygiene" refers to all types of industry such as those listed for "industrial hygiene" as well as financial and support services industries and refers to "work", "workplace" and "place of work" in general. Environmental hygiene addresses similar issues to occupational hygiene, but is likely to be about broad industry or broad issues affecting the local community, broader society, region or country. The profession of occupational hygiene uses strict and rigorous scientific methodology and often requires professional judgment based on experience and education in determining the potential for hazardous exposure risks in workplace and environmental studies. These aspects of occupational hygiene can often be referred to as the "art" of occupational hygiene and is used in a similar sense to the "art" of medicine. In fact "occupational hygiene" is both an aspect of preventive medicine and in particular occupational medicine, in that its goal is to prevent industrial disease, using the science of risk management, exposure assessment and industrial safety. Ultimately professionals seek to implement "safe" systems, procedures or methods to be applied in the workplace or to the environment. Occupational hygienists have been involved historically with changing the perception of society about the nature and extent of hazards and preventing exposures in the workplace and communities. Many occupational hygienists work day-to-day with industrial situations that require control or improvement to the workplace situation however larger social issues affecting whole industries have occurred in the past e.g. since 1900, asbestos exposures that have affected the lives of tens of thousands of people. Occupational hygienists have become more engaged in understanding and managing exposure risks to consumers from products with new regulations such as REACh (Registration, Evaluation, Authorisation and Restriction of Chemicals). More recent issues affecting broader society are, for example in 1976, legionnaires' disease or legionellosis. More recently again in the 1990s radon and in the 2000s the effects of mold from indoor air quality situations in the home and at work. In the later part of the 2000s concern has been raised about the health effects of nanoparticles. Many of these issues have required the coordination over a number of years of a number of medical and para professionals in detecting and then characterizing the nature of the issue, both in terms of the hazard and in terms of the risk to the workplace and ultimately to society. This has involved occupational hygienists in research, collection of data and to develop suitable and satisfactory control methodologies. The occupational hygienist may be involved with the assessment and control of physical, chemical, biological or environmental hazards in the workplace or community that could cause injury or disease. Physical hazards may include noise, temperature extremes, illumination extremes, ionizing or non-ionizing radiation, and ergonomics. Chemical hazards related to dangerous goods or hazardous substances are frequently investigated by occupational hygienists. Other related areas including indoor air quality (IAQ) and safety may also receive the attention of the occupational hygienist. Biological hazards may stem from the potential for legionella exposure at work or the investigation of biological injury or effects at work, such as dermatitis may be investigated. As part of the investigation process, the occupational hygienist may be called upon to communicate effectively regarding the nature of the hazard, the potential for risk, and the appropriate methods of control. Appropriate controls are selected from the hierarchy of control: by elimination, substitution, engineering, administration and personal protective equipment (PPE) to control the hazard or eliminate the risk. Such controls may involve recommendations as simple as appropriate PPE such as a 'basic' particulate dust mask to occasionally designing dust extraction ventilation systems, work places or management systems to manage people and programs for the preservation of health and well-being of those who enter a workplace. Disposable foam earplugs: out of the ear with coins for scale (top) and inserted into the wearer's ear (bottom). Analysis of physical hazards such as noise, which may require the use hearing protection earplugs and/or earmuffs to prevent hearing loss. Developing plans and procedures to protect against infectious disease exposure in the event of a flu pandemic. Monitoring the air for hazardous contaminants which may potentially lead to worker illness or death. Although there are many aspects to occupational hygiene work the most known and sought after is in determining or estimating potential or actual exposures to hazards. For many chemicals and physical hazards, occupational exposure limits have been derived using toxicological, epidemiological and medical data allowing hygienists to reduce the risks of health effects by implementing the "Hierarchy of Hazard Controls". Several methods can be applied in assessing the workplace or environment for exposure to a known or suspected hazard. Occupational hygienists do not rely on the accuracy of the equipment or method used but in knowing with certainty and precision the limits of the equipment or method being used and the error or variance given by using that particular equipment or method. Well known methods for performing occupational exposure assessments can be found in "A Strategy for Assessing and Managing Occupational Exposures, Third Edition Edited by Joselito S. Ignacio and William H. Bullock". The first step in understanding health risks related to exposures requires the collection of "basic characterization" information from available sources. A traditional method applied by occupational hygienists to initially survey a workplace or environment is used to determine both the types and possible exposures from hazards (e.g. noise, chemicals, radiation). The walk-through survey can be targeted or limited to particular hazards such as silica dust, or noise, to focus attention on control of all hazards to workers. A full walk-through survey is frequently used to provide information on establishing a framework for future investigations, prioritizing hazards, determining the requirements for measurement and establishing some immediate control of potential exposures. The Health Hazard Evaluation Program from the National Institute for Occupational Safety and Health is an example of an industrial hygiene walk-through survey. Other sources of basic characterization information include worker interviews, observing exposure tasks, material safety data sheets, workforce scheduling, production data, equipment and maintenance schedules to identify potential exposure agents and people possibly exposed. The information that needs to be gathered from sources should apply to the specific type of work from which the hazards can come from. As mentioned previously, examples of these sources include interviews with people who have worked in the field of the hazard, history and analysis of past incidents, and official reports of work and the hazards encountered. Of these, the personnel interviews may be the most critical in identifying undocumented practices, events, releases, hazards and other relevant information. Once the information is gathered from a collection of sources, it is recommended for these to be digitally archived (to allow for quick searching) and to have a physical set of the same information in order for it to be more accessible. One innovative way to display the complex historical hazard information is with a historical hazards identification map, which distills the hazard information into an easy to use graphical format. 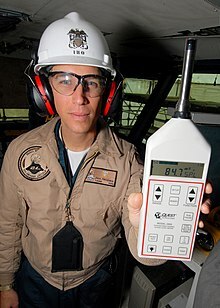 Measurements of noise levels using a sound level meter is a component of the occupational hygiene assessment. An occupational hygienist may use one or a number of commercially available electronic measuring devices to measure noise, vibration, ionizing and non-ionizing radiation, dust, solvents, gases, and so on. Each device is often specifically designed to measure a specific or particular type of contaminant. Such devices are often subject to multiple interferences. Electronic devices need to be calibrated before and after use to ensure the accuracy of the measurements taken and often require a system of certifying the precision of the instrument. Nuisance dust is considered to be the total dust in air including inhalable and respirable fractions. Respirable dust is sampled using a cyclone dust sampler design to sample for a specific fraction of dust AED at a set flow rate. The respirable dust fraction is dust that enters the 'deep lung' and is considered to be less than 10 micrometers AED. Nuisance, inhalable and respirable dust fractions are all sampled using a constant volumetric pump for a specific sampling period. By knowing the mass of the sample collected and the volume of air sampled a concentration for the fraction sampled can be given in milligrams (mg) per metre cubed (m3). From such samples the amount of inhalable or respirable dust can be determined and compared to the relevant occupational exposure limits. By use of inhalable, respirable or other suitable sampler (7 hole, 5 hole, et cetera) these dust sampling methods can also used to determine metal exposure in the air. This requires collection of the sample on a methyl-cellulose ester (MCE) filter and acid digestion of the collection media in the laboratory followed by measuring metal concentration though an atomic absorption (or emission) spectrophotometry. Both the UK Health and Safety Laboratory  and NIOSH Manual of Analytical Methods  have specific methodologies for a broad range of metals in air found in industrial processing (smelting, foundries, et cetera). A further method exists for the determination of asbestos, fibreglass, synthetic mineral fibre and ceramic mineral fibre dust in air. This is the membrane filter method (MFM) and requires the collection of the dust on a grided filter for estimation of exposure by the counting of 'conforming' fibres in 100 fields through a microscope. Results are quantified on the basis of number of fibres per millilitre of air (f/ml). Many countries strictly regulate the methodology applied to the MFM. Two types of chemically absorbent tubes are used to sample for a wide range of chemical substances. Traditionally a chemical absorbent 'tube' (a glass or stainless steel tube of between 2 and 10 mm internal diameter) filled with very fine absorbent silica (hydrophilic) or carbon, such as coconut charcoal (lypophylic), is used in a sampling line where air is drawn through the absorbent material for between four hours (minimum workplace sample) to 24 hours (environmental sample) period. The hydrophilic material readily absorbs water-soluble chemical and the lypophylic material absorbs non water-soluble materials. The absorbent material is then chemically or physically extracted and measurements performed using various gas chromatograph or mass spectrometry methods. These absorbent tube methods have the advantage of being usable for a wide range of potential contaminates. However, they are relatively expensive methods, are time consuming and require significant expertise in sampling and chemical analysis. A frequent complaint of workers is in having to wear the sampling pump (up to 1 kg) for several days of work to provide adequate data for the required statistical certainty determination of the exposure. In the last few decades, advances have been made in 'passive' badge technology. These samplers can now be purchased to measure one chemical (e.g. formaldehyde) or a chemical type (e.g. ketones) or a broad spectrum of chemicals (e.g. solvents). They are relatively easy to set up and use. However, considerable cost can still be incurred in analysis of the 'badge'. They weigh 20 to 30 grams and workers do not complain about their presence. Unfortunately 'badges' may not exist for all types of workplace sampling that may be required and the charcoal or silica method may sometimes have to be applied. From the sampling method, results are expressed in milligrams per cubic meter (mg/m3) or parts per million (PPM) and compared to the relevant occupational exposure limits. It is a critical part of the exposure determination that the method of sampling for the specific contaminate exposure is directly linked to the exposure standard used. Many countries regulate both the exposure standard, the method used to determine the exposure and the methods to be used for chemical or other analysis of the samples collected. The hierarchy of control defines the approach used to reduce exposure risks protecting workers and communities. These methods include elimination, substitution, engineering controls (isolation or ventilation), administrative controls and personal protective equipment. Occupational hygienists, engineers, maintenance, management and employees should all be consulted for selecting and designing the most effective and efficient controls based on the hierarchy of control. The development of industrial hygiene societies originated in the United States, beginning with the first convening of members for the American Conference of Governmental Industrial Hygienists in 1938, and the formation of the American Industrial Hygiene Association in 1939. In the United Kingdom, the British Occupational Hygiene Society started in 1953. Through the years, professional occupational societies have formed in many different countries, leading to the formation of the International Occupational Hygiene Association in 1987, in order to promote and develop occupational hygiene worldwide through the member organizations. The IOHA has grown to 29 member organizations, representing over 20,000 occupational hygienists worldwide, with representation from countries present in every continent. There are several academic journals specifically focused on publishing studies and research in the occupational health field. The Journal of Occupational and Environmental Hygiene (JOEH) has been published jointly since 2004 by the American Industrial Hygiene Association and the American Conference of Governmental Industrial Hygienists, replacing the former American Industrial Hygiene Association Journal and Applied Occupational & Environmental Hygiene journals. Another seminal occupational hygiene journal would be The Annals of Occuapational Hygiene, published by the British Occupational Hygiene Society since 1958. Further, The National Institute for Occupational Safety and Health maintains a searchable bibliographic database (NIOSHTIC-2) of occupational safety and health publications, documents, grant reports, and other communication products. The hierarchy of controls is an important tool to determine how to control hazards most efficiently and effectively in a workplace. The basis of the technical knowledge of occupational hygiene is from competent training in the following areas of science and management. Environment (air pollution, hazardous waste). However, it is not rote knowledge that identifies a competent occupational hygienist. There is an "art" to applying the technical principles in a manner that provides a reasonable solution for workplace and environmental issues. In effect an experienced "mentor", who has experience in occupational hygiene is required to show a new occupational hygienist how to apply the learned scientific and management knowledge in the workplace and to the environment issue to satisfactorily resolve the problem. To be a professional occupational hygienist, experience in as wide a practice as possible is required to demonstrate knowledge in areas of occupational hygiene. This is difficult for "specialists" or those who practice in narrow subject areas. Limiting experience to individual subject like asbestos remediation, confined spaces, indoor air quality, or lead abatement, or learning only through a textbook or “review course” can be a disadvantage when required to demonstrate competence in other areas of occupational hygiene. Information presented in Wikipedia can be considered to be only an outline of the requirements for professional occupational hygiene training. This is because the actual requirements in any country, state or region may vary due to educational resources available, industry demand or regulatory mandated requirements. Academic programs offering industrial hygiene bachelor's or master's degrees in United States may apply to the Accreditation Board for Engineering and Technology (ABET) to have their program accredited. As of October 1, 2006, 27 institutions have accredited their industrial hygiene programs. Accreditation is not available for Doctoral programs. In the U.S. the training of IH professionals is supported by National Institute for Occupational Safety and Health through their NIOSH Education and Research Centers. In 2005, the Australian Institute of Occupational Hygiene (AIOH) has accredited professional occupational hygienist through a certification scheme. Occupational Hygienists in Australian certified through this scheme are entitled to use the phrase Certified Occupational Hygienist (COH) as part of their qualifications. Practitioners who successfully meet specific education and work-experience requirements, and pass a written examination administered by the American Board of Industrial Hygiene (ABIH) are authorized to use the term Certified Industrial Hygienist (CIH) or Certified Associate Industrial Hygienist (CAIH). Both of these terms have been codified into law in many states in the United States to identify minimum qualifications of individuals having oversight over certain activities that may affect employee and general public health. After the initial certification, the CIH or CAIH maintains their certification by meeting on-going requirements for ethical behavior, education, and professional activities (e.g., active practice, technical committees, publishing, teaching). ABIH certification examinations are offered during a spring and fall testing window each year at more than 400 locations worldwide. The CIH designation is the most well known and recognized industrial hygiene designation throughout the world. There are approximately 6800 CIHs in the world making ABIH the largest industrial hygiene certification organization. The CAIH certification program was discontinued in 2006. Those who were certified as a CAIH retain their certification through ongoing certification maintenance. People who are currently certified by the ABIH can be found in a public roster. The ABIH is a recognized certification board by the International Occupational Hygiene Association (IOHA). The CIH certification has been accredited internationally by the International Organization for Standardization/International Electrotechnical Commission (ISO/IEC 17024) (see ANSI). In the United States, the CIH has been accredited by the Council of Engineering and Scientific Specialty Boards [CESB]. The Association of Professional Industrial Hygienists, Inc. (APIH) was established in 1994 to offer credentialing to industrial hygienists who meet the education and experience requirements found in Tennessee Code Annotated, Title 62, Chapter 40. APIH adopted the Tennessee Code as its basis for credentialing because it was the first legal definition in the United States of an industrial hygienist in terms of education and experience. The APIH Registration Committee investigates and verifies, through electronic means or correspondence, both educational and experience accomplishments claimed by each applicant for registration. The Committee determines the appropriate level of registration, Registered Industrial Hygienist or Registered Professional Industrial Hygienist, and then authorizes the registration certificate to be issued. In Canada, a practitioner who successfully completes a written test and an interview administered by the Canadian Registration Board of Occupational Hygienists can be recognized as a Registered Occupational Hygienist (ROH) or Registered Occupational Hygiene Technician (ROHT). There is also designation to be recognized as a Canadian Registered Safety Professional (CRSP). The Faculty of Occupational Hygiene, part of the British Occupational Hygiene Society, represents the interests of professional occupational hygienists. Membership of the Faculty of Occupational Hygiene is confined to BOHS members who hold a recognized professional qualification in occupational hygiene. Licentiate (LFOH) holders will have obtained the BOHS Certificate of Operational Competence in Occupational Hygiene and have at least three years’ practical experience in the field. Members (MFOH) are normally holders of the Diploma of Professional Competence in Occupational Hygiene and have at least five years’ experience at a senior level. Fellows (FFOH) are senior members of the profession who have made a distinct contribution to the advancement of occupational hygiene. All Faculty members participate in a Continuous Professional Development (CPD) scheme designed to maintain a high level of current awareness and knowledge in occupational hygiene. Indian Society of Industrial hygiene was formed in 1981 at Chennai India. Subsequently, its secretariat was shifted to Kanpur. The society has registered about 400 members, about 90 of whom life members. The society publishes a newsletter "Industrial Hygiene Link". The current address of the secretary of the society is Shyam Singh Gautam, Secretary, Indian Society of Industrial Hygiene, 11, Shakti Nagar, Rama Devi, Kanpur 2008005 Mobile number 8005187037. ^ "Australian Institute of Occupational Hygienists". aioh.org.au. Archived from the original on 2005-07-17. Retrieved 2009-05-23. ^ Council, National Research (2008-12-03). Science and Decisions: Advancing Risk Assessment. doi:10.17226/12209. ISBN 9780309120463. PMID 25009905. ^ "British Occupational Hygiene Society (BOHS)". bohs.org. Archived from the original on 2009-08-30. Retrieved 2010-03-02. ^ "Home » IOHA - International Occupational Hygiene Association". IOHA - International Occupational Hygiene Association. Retrieved 2016-04-07. ^ EM, FIU ARC, DOE. "D&D KM-IT - Deactivation & Decommissioning powered by the global community!" (PDF). www.dndkm.org. ^ "Health and Safety Laboratory". hsl.gov.uk. Archived from the original on 2009-06-16. Retrieved 2009-05-27. ^ "CDC - NIOSH Publications and Products - NIOSH Manual of Analytical Methods (2003-154) -". www.cdc.gov. Retrieved 2016-04-07. ^ a b "About IOHA". International Occupational Hygiene Association. Archived from the original on 2012-11-06. Retrieved 8 November 2012. ^ "National Societies". International Occupational Hygiene Association. Archived from the original on 2012-11-06. Retrieved 8 November 2012. ^ "Taylor & Francis Online:: Journal of Occupational and Environmental Hygiene - Aims & Scope". Retrieved 8 November 2012. ^ "Oxford Journals – Life Sciences & Medicine – The Annals of Occupational Hygiene". Retrieved 8 November 2012. ^ "About NIOSHTIC-2 – CDC/NIOSH". NIOSH. Retrieved 8 November 2012. ^ "Association of Professional Industrial Hygienists". apih.us. Retrieved 2016-04-07. Many larger businesses maintain their own product and chemical information. There are also many subscription services available (CHEMINFO, OSH, CHEMpendium, Chem Alert, Chemwatch, Infosafe, RightAnswer.com's TOMES Plus, OSH Update, OSH-ROM, et cetera). Wikimedia Commons has media related to Industrial hygiene. This page was last edited on 2 April 2019, at 17:12 (UTC).